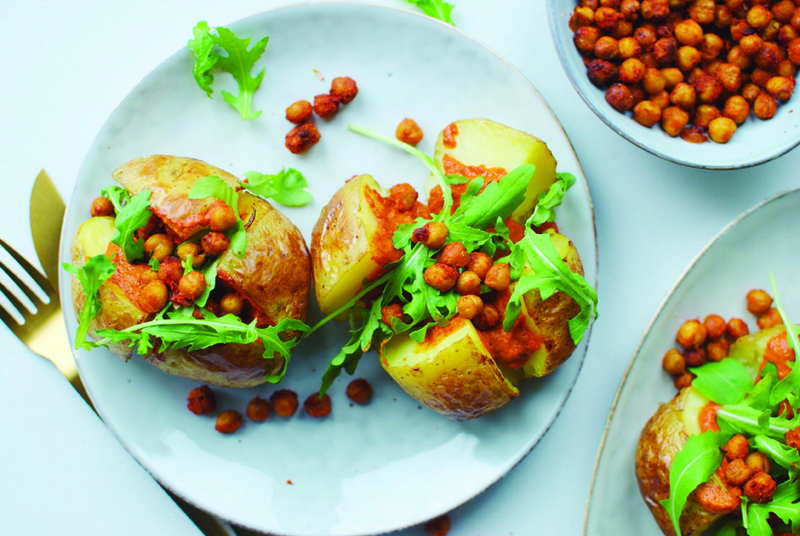 Get some protein into a vegan diet with this tasty chickpea curry jacket. Heat oven to 200C/180C fan/gas 6. Prick the sweet potatoes all over with a fork, then put on a baking tray and roast in the oven for 45 mins or until tender when pierced with a knife. Meanwhile, melt the coconut oil in a large saucepan over medium heat. Add the cumin seeds and fry for 1 min until fragrant, then add the onion and fry for 7-10 mins until softened. Put the garlic, ginger and green chilli into the pan, and cook for 2-3 mins. Add the spices and tikka masala paste and cook for a further 2 mins until fragrant, then tip in the tomatoes. Bring to a simmer, then tip in the chickpeas and cook for a further 20 mins until thickened. Season. Put the roasted sweet potatoes on four plates and cut open lengthways. Spoon over the chickpea curry and squeeze over the lemon wedges. Season, then scatter with coriander before serving.